Cesar Sayoc Jr. was tracked down swiftly as the FBI joined forces with New York City police, the U.S. Postal Inspection Service, and officers in Florida, Justice Department officials said Friday. The 56-year-old former soccer player is in FBI custody and has been charged with sending bombs to prominent Democrats including Barack Obama, Hillary Clinton and Joe Biden; CNN, and philanthropist George Soros. The 13 packages Sayoc mailed each contained PVC pipe, with an “energetic material”—something that can explode—and a clock, said Christopher Wray, the FBI director. “These were not hoax devices,” he said, an apparent reference to the right-wing conspiracy theories that packages were a “false flag” intended to make Republicans look bad. Several of the packages also included photos of the intended target, with a red “X” over their face, according to a copy of the federal complaint against Savoy. 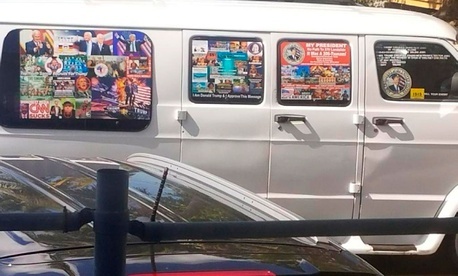 They mirror decals on a van associated with Sayoc that was towed away in Plantation, Florida that show Hillary Clinton, filmmaker Michael Moore and others with a gun target over their faces. Officials say a “latent fingerprint” found on one of the two packages addressed to Maxine Waters, the California congresswoman, which led them to Sayoc, who had been previously arrested. There is also DNA on two of the devices that could connect them to the suspect, Wray said, but he did not elaborate. A U.S. postal worker alerted officials to some of the packages, Gary Barksdale, the deputy chief inspector at the U.S. Postal Inspection Service, told reporters. Sayoc is also linked to a Twitter account that has many of the same misspellings that were on the packages, the complaint against him notes. Sayoc faces nearly 60 years in prison, officials said, after being charged with five federal crimes, including transporting explosives across state lines and in the mail, and threatening to kill a former president. Wray did not answer questions about Sayoc’s possible motivation and whether the incendiary words of Donald Trump might have pushed him to send out the devices. “We’re focused not on the talk, but on the work of men and women of law enforcement,” Wray said. “It is too early for us to be discussing motivations,” he said.